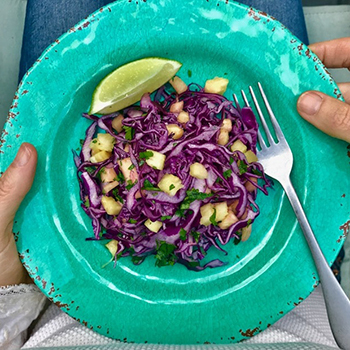 We affectionately call this salad “Purplicious” because it really is purple and delicious, and loved by all in our families. We love it for a quick and healthy side dish that can be whipped up in less than a half hour. It’s great last-minute and even better the next day for lunch. Top it with a grilled chicken breast or pork loin and boom, dinner is done. Combine cabbage, pineapple, carrots, lime juice, extra-virgin olive oil, maple syrup, sea salt, and cilantro in a medium bowl. Stir together until well mixed. Refrigerate until ready to serve. Season with more lime juice and sea salt to taste if desired.